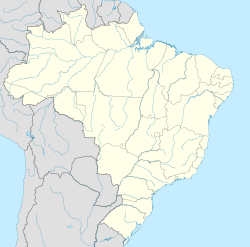 Francisco Badaró is a municipality in the northeast of the Brazilian state of Minas Gerais. As of 1997 the population was 10,269 in a total area of 463 km². The elevation of the town center is 377 meters. It is part of the IBGE statistical mesoregion of Jequitinhonha and the micro-region of Capelinha. It became a municipality in 1962. The economy is based on cattle raising and subsistence agriculture, with the main crops being beans, manioc, sugarcane, and corn. 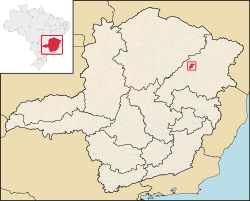 Neighboring municipalities are: [Berilo, Jenipapo de Minas, Virgem da Lapa, Chapada do Norte, Araçuaí]. The distance to Belo Horizonte is 723 km. Francisco Badaró is ranked low on the MHDI[clarification needed] and was one of the poorest municipalities in the state and in the country in 2000. The above figures can be compared with those of Poços de Caldas, which had an MHDI? of .841, the highest in the state of Minas Gerais. The highest in the country was São Caetano do Sul in the state of São Paulo with an MHDI of .919. The lowest was Manari in the state of Pernambuco with an MHDI of .467 out of a total of 5504 municipalities in the country as of 2004[update]. At last count[when? ], Brazil had 5,561 municipalities. ^ a b c "Francisco Badaró (Municipality, Minas Gerais, Brazil) - Population Statistics, Charts, Map and Location". www.citypopulation.de. 1 September 2017. Retrieved 14 March 2018. ^ "Título incorrecto". Wikipedia, la enciclopedia libre (in Spanish). 12 October 2017. Retrieved 14 March 2018. This page was last edited on 9 October 2018, at 00:52 (UTC).